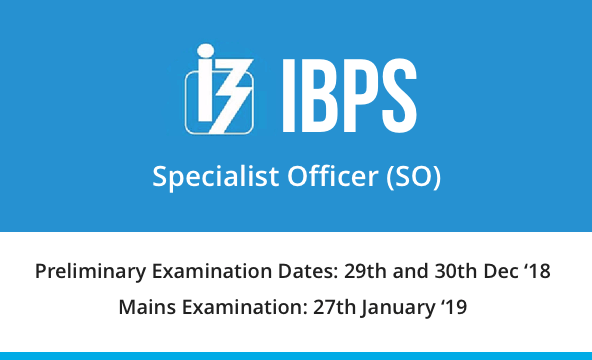 IBPS has released IBPS SO Interview Call Letter 2018-19 for the post of Specialist Officer. IBPS SO 2018 Inteview exam will be conducted till 2nd March 2019. Candidates who have cleared for IBPS SO 2018-19 Maoins Exam can download their call letters / admit card for IBPS SO Interview Process by clicking on the link that is mentioned below. IBPS will release the Admit Card for IBPS SO 2018-19 Exam in sequence, i.e. IBPS SO Admit Card for Preliminary Exam will be released first followed by IBPS SO Admit Card for Mains Exam. IBPS SO Admit Card for Mains Exam will be issued only to those candidates who have cleared the Preliminary Phase of the Examination. There are certain pre-requisites that a candidate needs to have to download his/her IBPS SO 2018 Admit Card. A candidate needs to make sure that he/she has a good internet connection while downloading the IBPS SO 2018 Admit Card. Always remember to keep extra copies of the Admit Card with you in order to avoid any discrepancy on the date of the examination. After downloading your IBPS SO 2018 Admit Card, keep a note of your exam timing and exam centre to have a hassle free exam day. Keeping in mind the IBPS SO 2018 exams, we are launching various Test Series (Tier 1 + 2), Classroom Programs and Seminars to guide you through your preparations. Keeping in mind the IBPS SO 2018 exam, we are launching various Test Series (Tier 1 + 2), Classroom Programs and Seminars to guide you through your preparations.